Microsoft Excel is a program used to create electronic spreadsheets, to organize data into rows and columns and to perform mathematical calculations. By installing novaPDF you can convert your spreadsheets and workbooks into PDF files – simply choose novaPDF as a printer and once you click the Print button your spreadsheet will be converted to a PDF. Having your Excel spreadsheet in PDF format is an advantage if you want to send it to other users (the persons receiving it do not need in this case Excel installed) or to print it. 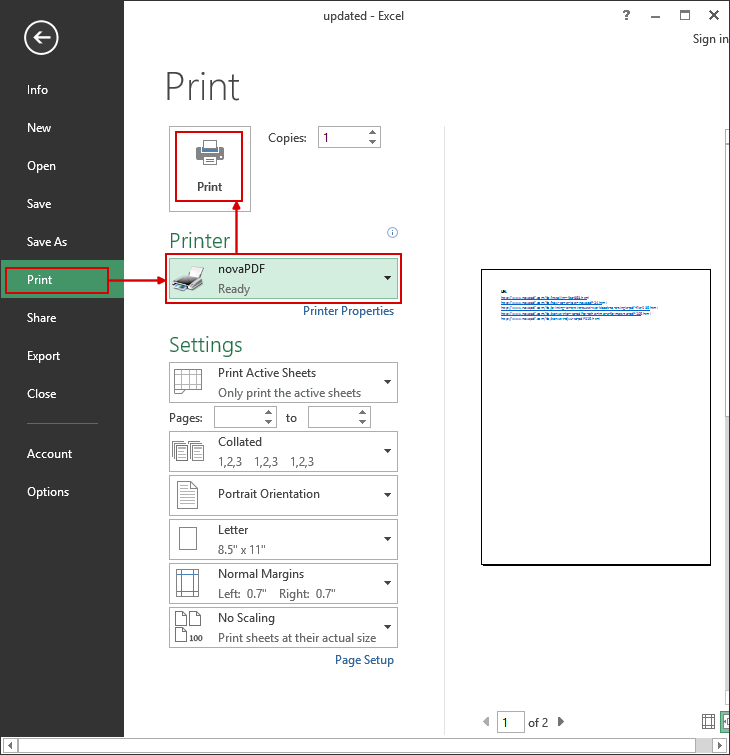 In the Settings section, you can choose to print the active worksheets (Print Active sheets), certain areas of the worksheet (Print Selection) or the Entire workbook. 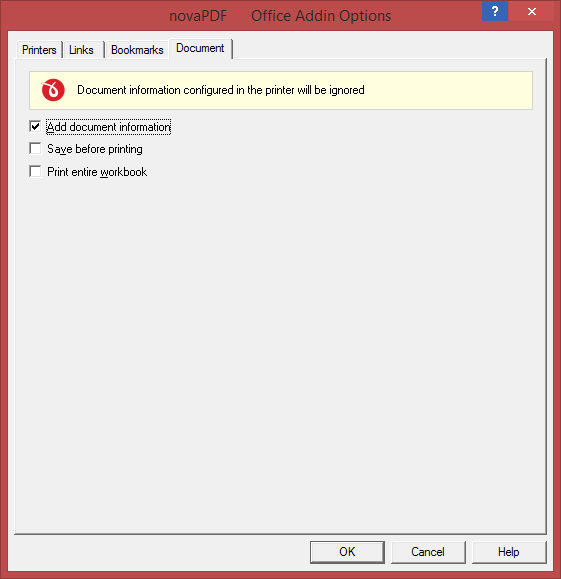 During installation novaPDF gives the option to install add-ins for Microsoft Office. By default is checked and it will add in the supported Microsoft Office applications (i.e. 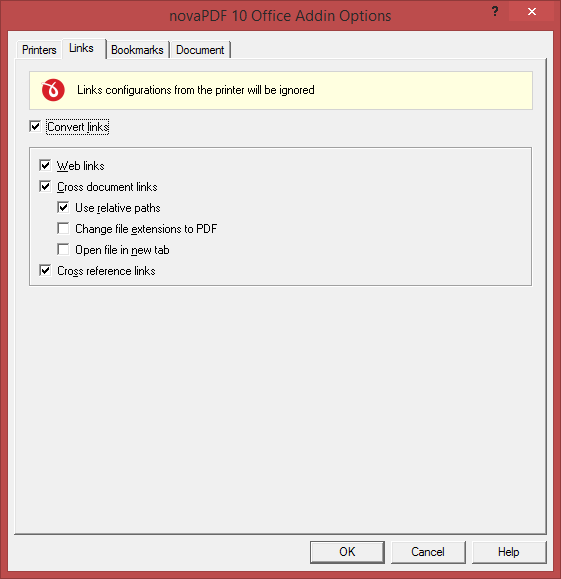 Word, Excel, PowerPoint) another tab called novaPDF that will let users create PDF files directly from the Office interface by simply clicking a button. Click on Save As PDF and you'll be asked for a location where to save the resulting PDF file when you press OK.
Add document information - If you have any information added via document properties in Excel, you can have that recognized and transmitted in the PDF as Document Information (i.e. the Author, Title/Subject, Keywords, ...). By default this option is checked. Convert sheet names to PDF bookmarks - If this is checked, sheet names from the Excel workbook will become bookmarks in the resulting PDF file. Print entire workbook - If you have an workbook with several sheets you can convert it entirely to a single PDF document by checking this box. 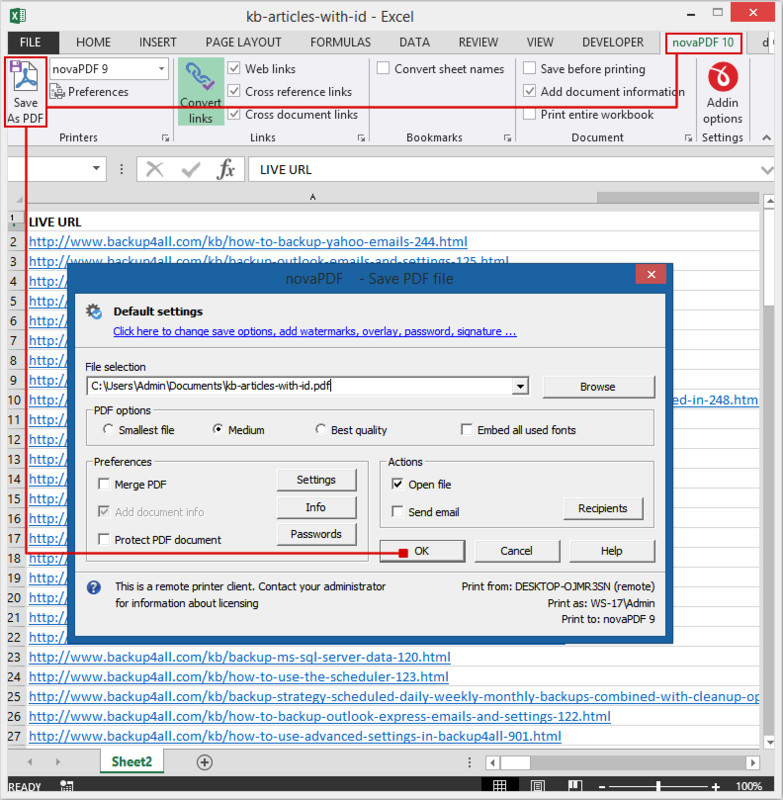 Convert cross reference links - If checked this will convert the cross-reference links from Excel (links that point the reader to various places within the same document). This tutorial shows how to convert Excel to PDF files (xls/xlsx to pdf), if you have suggestions on how to improve this article add a comment or rate it.